In the present work, high-resolution molecular stratigraphy technique has been applied to the rock samples from Tumaco-1-ST-P well to investigate vertical variations of the deposited organic matter (O.M.) based on screening parameter and high-resolution biomarkers in both saturate and aromatic fractions in order to establish its origin, organic facies, depositional paleoenvironment, thermal maturity, biodegradation processes and to evaluate the exploratory potential in this frontier forearc basin. The O.M. is immature with a high concentration of biolipids (early diagenesis) and with poor to fair generation potential originated from a type II/III or III kerogen. 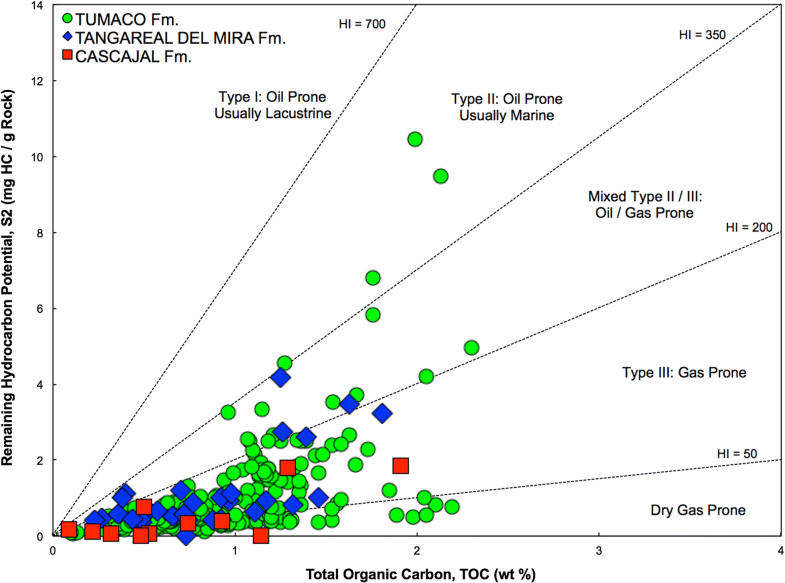 Original total organic carbon (TOCo) and original hydrocarbon index (HIo) values for each formation and lithology are determined to evaluate the hydrocarbons potential in the basin. 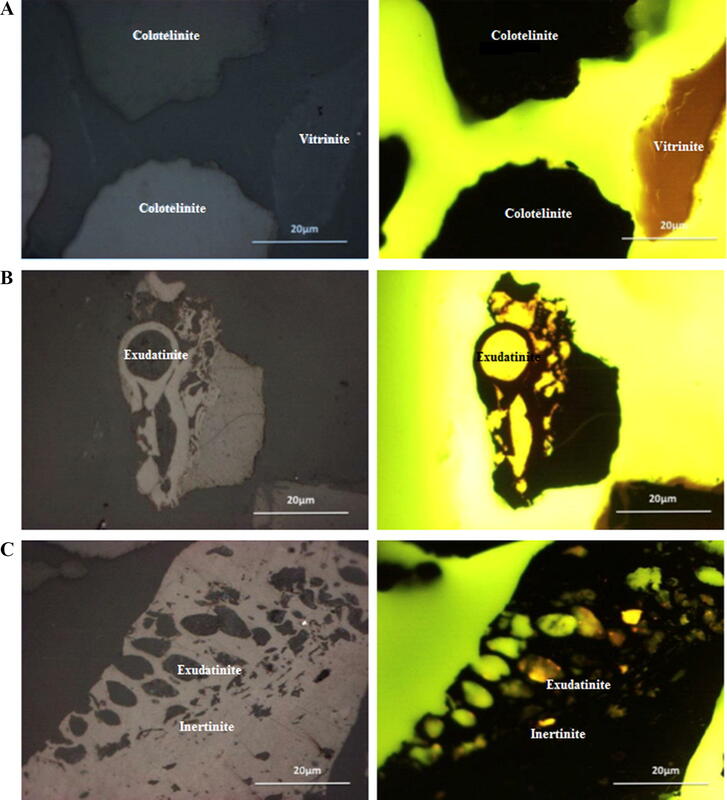 n-alkanes, isoprenoids, and tricyclic terpanes suggest an algal/bacterial and terrestrial input deposited on a marine-deltaic shale under oxic to suboxic conditions. The O.M. was deposited on siliciclastic rocks in a marine-continental (transitional) environment, although carbonate rocks were also deposited in the bottom of the column (late Oligocene). The molecular stratigraphic interpretation allows to conclude that organic facies and lithology in Tumaco-1-ST-P are characterized in Cascajal and Tangareal del Mira Fms. (1000–5000 ft) by a marine-deltaic paleoenvironment with an important terrestrial contribution and varying between deltaic plain and prodelta during the late Miocene. At the top of Tumaco Fm (5000–9000 ft) in the late to medium Miocene, the depositional environment was like the marine delta of the Tangareal del Mira Fm, changing to a marine platform environment at 8000 to 10,000 ft depth in the middle to early Miocene. Toward the bottom of the column (10,000–12,000 ft), Tumaco Fm was deposited in the late Oligocene under a marine shelf environment. In the present paper, we propose a modeling approach, based on the evolution of the thermal maturity through the stratigraphic column, that at 17,000 feet depth could exist rocks with O.M. in the hydrocarbon generation window for Tumaco Basin, Colombia. Tumaco basin is a frontier basin under the influence of a subduction zone of the Pacific active margin. Consequently, the importance of both the new stratigraphic and the geochemical data is essential to provide new information for developing new exploration projects in the Colombian Pacific margin. The Tumaco-1-ST-P stratigraphic well gives evidences of the Tumaco basin sedimentation system during the late Oligocene to Pliocene, dominated by the movements of the paleodeltas of the Tumaco and Mira rivers (ANH-Universidad de Caldas 2011, ANH-Antek S.A. 2013). In the late Oligocene-middle Miocene, Tumaco Fm is observed the presence of a large deltaic complex (associated with paleodelta of the Patia River), with sources areas that involve, at least partially, the Central Cordillera. For the late Miocene–early Pliocene, the displacement to the north of the Patía River leads to the establishment of the Mira fluvio-deltaic system in the area, represented by deposits of the Tangareal del Mira Fm, which is the only present source areas of the Western Cordillera. Finally, in the late Pliocene, deltaic deposits of Cascajal Fm record a period of intense volcanism (ANH-Antek S.A. 2013). The application of high-resolution organic geochemical techniques to evaluate the sedimentary sequence on a “layer-by-layer” basis is called “molecular stratigraphy” (Brassell et al. 1986; Farrimond et al. 1990; Keely et al. 1993). 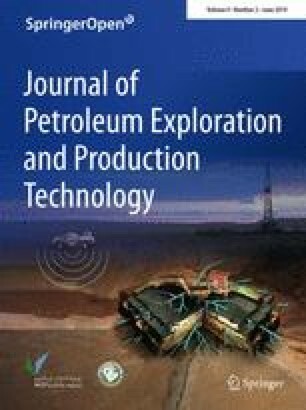 In this study, this approach was applied to investigate the evolution of the sedimentary organic matter in the Tumaco-1-ST-P stratigraphic well in the range between 750 and 11,930 ft covering the Miocene–Oligocene sequence in the onshore Tumaco basin, Colombia to characterize the origin and type of organic matter, paleodepositional environment, genetic relation between bitumen, maturity, and possible degradation processes in a sedimentary basin under the subduction influence. The onshore Tumaco basin is located in the southwestern of Colombia. The basin is bounded by the Garrapatas fault system in the north, Ecuador country in the south, Western Cordillera (uplift) in the east, and the Pacific Ocean in the west (IGAC-Ingeominas 2001; Barrero et al. 2007; Cediel et al. 2010; ANH-Universidad de Caldas 2011; Borrero et al. 2015). The Tumaco forearc basin contains a pre-Miocene mega-sequence and three post-lower Miocene sequences deposited in shelf to bathyal environments. The basin basement is made up of Cretaceous metasedimentary and volcanic rocks (Cediel et al. 2010). The study area map and detailed stratigraphy column of the Tumaco-1-ST-P well are given in Figs. 1 and 2, respectively (ANH-Antek S.A. 2013). Previous work including a detailed discussion of the geology of the onshore Tumaco basin is found in the literature derived from recent projects led by National Hydrocarbon Agency, Colombia (Universidad de Caldas 2011; ANH-Antek S.A. 2013). Suárez (2007) studied the Colombian Pacific provinces using a data set including seismic, gravimetric, and aeromagnetometric data. Additional geological and tectonic data can be searched in publications by Suárez (2007), Echeverri et al. (2011), and Echeverri et al. (2015). Stratigraphic studies of the area have been published by Cediel et al. (2010) based on the description of the Chagüi-1, Majagua-1 y Remolino Grande-1 stratigraphic wells. In brief, the basement of the Tumaco basin is interpreted as an allochthonous block composed of fragments of oceanic plateau (Kerr et al. 2002) and the Santonian–Campanian arc of islands, accreted to the continent during the late Cretaceous and early Paleocene (ANH-Universidad de Caldas 2011). The following discussion about geological setting and regional stratigraphy is taken from the technical report presented by Antek S.A. to the National Hydrocarbon Agency (NHA), Colombia (ANH-Antek S.A. 2013). The Tumaco formation (Chatiense-early Tortoniense) is composed of interbedded mudstones, arenite, and occasionally conglomerates covering the bottom of Tumaco 1-ST-P well (interval 11,980–5381 ft), which has a thickness greater than the 6599 ft (the base is not present). The rocks of this unit can be grouped into eight facies associations represented by bar and estuarine channels, mouth bar, coastal lagoon, proximal front deltaic, prodelta, and platform deposits, respectively. In the facies associated with the Tumaco Fm, occur occasional mudstones, sandstones and conglomerates, abundant fossils of marine affinity and evidence of rocks associated with deltaic paleoenvironment with the influence from the continent, it allows considering the existence during the late Oligocene and much of the Miocene of an enormous deltaic complex dominated by waves and tides. It seems to correspond to the paleodelta of the Patia River when it disembogued in the area now occupied by the Tumaco Bay. The Tumaco Fm origin indicates an input area that, at least partially, involved sectors of the Central Cordillera that were recorded in the stratigraphic record with the presence of minerals such as garnets and pumpellyite and fragments of metamorphic rocks such as marbles, although there is a clear preponderance of a mafic–intermediate source area and some recycled rocks of the first cycle. The Tangareal del Mira Fm (middle Tortoniense-Zancliense), rests unconformably on the Tumaco Fm covering the interval between 1437 and 5381 ft (thickness 3944 ft). In general, the unit consists of interbedded lithic sandstones and mudstones with a development of conglomerates at the base that can be grouped into five associations of facies representing river channels, bar and fluvial channels, bay estuarine, prodelta, and front deltaic deposits. As in Tumaco Fm, the set of facies and facies associations of Tangareal del Mira Fm allow us to observe the presence of abundant fossils of marine affinity and evidence of continental contribution that would support the existence of a deltaic complex dominated by waves and tides occurs with migration north Mira River in the late Miocene, the position left to the Patia River Delta in its movement to its present site mouth. The development of fluvial facies at the base of the unit, showing the relative fall of sea level in the area, which is succeeded by two transgressive–regressive greater cycles, where is evident a high volcanic influence. The Cascajal formation (Zancliense), which was examined in detailed in Tumaco-1-ST-S well, since in Tumaco-1-ST-P well, only cuttings were available and partially in some outcrops located on the Tumaco Bay; it is composed of interbedded mudstones, litoarenites, and conglomerate facies, locally bioturbated, it reposes unconformably on the Tangareal del Mira Fm. Moreover, it may be characterized in five associations of facies represented by the proximal deltaic front, distal deltaic front, channels, and estuarine bars, mouth bar, and prodelta deposits (ANH-Universidad de Caldas 2011; ANH-Antek S.A. 2013). The facies associated with Cascajal formation allow to observe the presence of bioturbated segments, abundant fossils of marine affinity and the continental influence that would support the existence during the late Pliocene of a deltaic complex dominated by waves and tides (Fig. 4) which is associated with the progradation of the delta of Mira River. In this unit, the volcanic contribution is even greater than in the Tangareal del Mira. 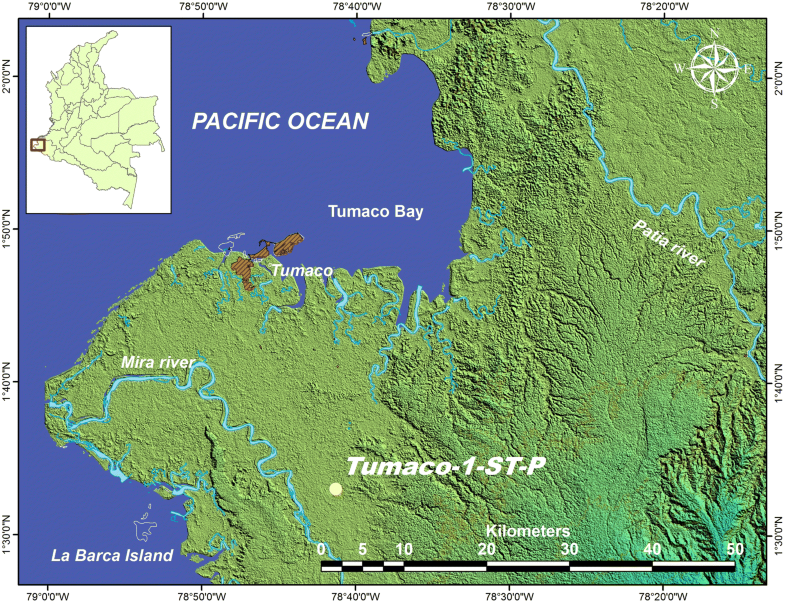 The Quaternary is represented by the first 110.89 ft of Tumaco 1-ST-S well (ANH-Universidad de Caldas 2011), which corresponds to fluvial deposits of the Mira River. These deposits consist of interbedded litoarenites and sublitoarenites, massive mudstones, and occasional interbedded polymictic conglomerates with a significant contribution of volcanic rocks. Samples were selected from the stratigraphic column in the interval 750 to 12,000 ft covering the Miocene to the late Oligocene in the Tumaco-1-ST-P well. Two hundred and fifty samples were analyzed for TOC and RE-Py, 25 samples for vitrinite reflectance, and 100 samples for extractable organic matter (EOM), SARA fractionation, GC/FID, and GCMS analyses applying Antek S.A. geochemical validated procedures, which are part of its ONAC-ISO-17025 quality assurance manual (Antek S.A. 2011). All the samples were picked and washed to remove any contaminant. After the samples had been air-dried or oven-dried, they were crushed on porcelain mortar and pestle up to 62 µm for screening analysis, organic matter extraction, and biomarkers analysis. For TOC analysis, 1 g of rock and cutting powder were digested overnight with 10% HCl to remove the carbonate, then washed and dried in oven at 60 °C for 24 h. Approximately 100 mg of sample was transferred onto a Leco cell and mixed with copper/iron catalyst. TOC analysis was run on a Leco S-200 carbon analyzer. Rock–Eval pyrolysis analysis was done in a Vinci-VI instrument with temperature programmed from 30 to 600 °C at 30 °C/min rate. Helium was maintained at 60 mL/min. S1, S2 peaks and Tmax were detected by FID detector, while S3 peak was quantitated by TCD detector. All samples presented a relatively poor dispersed organic matter that it was necessary to make a organic matter concentration with zinc chloride (ZnCl2), a heavy liquid prepared at a density of near 2 g/mL (ICCP 1963; ISO 1985, 1994; Pawlewicz 2013). Vitrinite reflectance analysis was conducted according to ASTM D-7708-11 and ISO-7404 standard methods. The measurements were done using a Carl Zeiss model Axio-Imager-100 petrographic microscope equipped with reflected and fluorescence UV light in the spectral range between 200 and 3000 nm. The microscope was coupling to a Craic model CoalPro spectrophotometer and a high-speed high-resolution photographic camera. The system was calibrated using a 0.4, 0.9, 1.7, and 5.3% synthetic standards. The microphotometer was equipped with an oil immersion objective (X50/0.85). The oil immersion used has a refraction index of 1.5189 at 23 °C over sodium light at 589.3 nm. The reflectance was measured with normal incident monochromatic light at wavelength of 546 nm. Rock powder samples were extracted using a Dionex ASE-200 accelerated extraction equipment. The solvent was 100% DCM. The extraction condition were solvent pressure at 1500 psi, extraction cell temperature of 100 °C, static pressure time of 2 min, solvent flush 75%, and nitrogen purge time of 60 s. After extraction, the solvent was removed until almost dried by rotaevaporation in a Buchi model 130 rotaevaporator and then transferred in a 4 mL pre-weighted vial. Finally, the extracts were dried with a nitrogen stream and the extractable organic matter (EOM) was determined by gravimetry. Due to the low EOM content, all the bituminous extracts were used for SARA fractionation by microcolumnation on alumina. The bituminous extracts were dissolved in an excess of n-pentane, and the asphaltenes were precipitated overnight at -10 °C into the refrigerator. Asphaltenes were separated from maltene fraction by centrifugation. The maltene was fractionated by liquid chromatography on activated silica gel in saturates, aromatics, and resins. The saturated fraction was eluted with n-hexane; the aromatic fraction was eluted with n-hexane: dichloromethane (70:30), and the polar (NSO) fraction was eluted with dichloromethane: methanol (98:2). The saturated fraction was analyzed by GC/FID. The branched and cyclic fractions (biomarkers) were separated from n-alkanes by silicalite powder S-115 and then analyzed by SIM-GC/MS. The aromatic fractions were analyzed directly by GC/FID, and some selected samples were analyzed for aromatic biomarkers by gas chromatography-mass spectrometry (SIM-GC/MS). C15+ saturated fractions obtained from SARA analysis were dissolved according to the mass with n-hexane (approximately 10 mg/mL) and analyzed using an Agilent 6890 HRGC/FID fitting with a DB-1 60 m × 0.25 mm × 0.25 μm capillary column. Samples were injected in splitless mode. The GC oven temperature was programmed from 60 to 320 °C at 5 °C/min. Helium was used as carrier gas at a linear velocity of 50 cm/s (12 psig). Injector/detector was maintained at 320 °C/350 °C, respectively. Data handling was done with Agilent Chemstation version 10 chromatographic software. SIM-GC/MS of branched and cyclic and aromatic hydrocarbons was analyzed using an Agilent 7890B gas chromatograph coupling to an Agilent 5975C VL MSD mass spectrometer. The separation was carried out using a Restek Rtx-5MS of 60 m × 0.25 mm × 0.25 µm capillary column operated at constant flow (1 mL/min) (initial head column pressure of 8.23 psi) and the linear velocity of 20 cm/s. Column program started at 60 °C (2 min) to 320 °C at 3 °C/min and maintained at 320 °C for 11 °C/min. The ion source was operated in electronic impact (EI) mode at 70 eV at 150 °C. The MS was operated in selective ion monitoring (SIM) for the following saturate ions: internal standard, Squalane (m/z 99 and 113); n-alkanes (m/z 99); isoprenoids (m/z 183), terpanes (m/z 191), demethylated hopanes (m/z 177), steranes (m/z 217 and 218) and aromatic ions: alkylnaphthalenes (m/z 128, 142, 156, 170), alkylphenanthrenes (m/z 178), alkyldibenzothiophenes (m/z 184), monoaromatic steroids (m/z 253), and triaromatic steroids (m/z 253). The Agilent ChemStation version A02.00 (2012) was utilized as data acquisition system. 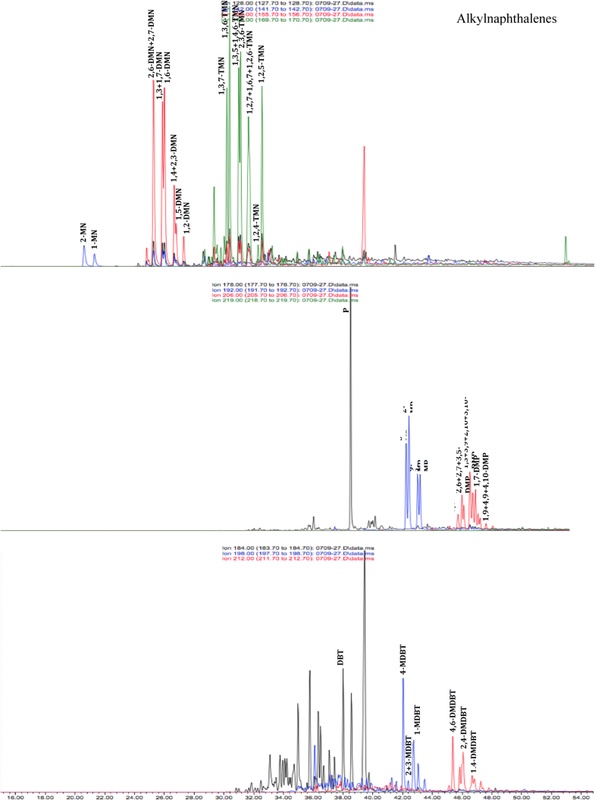 Biomarker quantitation was done using the area peaks from the GC/MS traces. TOC and Rock–Eval pyrolysis results are summarized in Table 1. TOC content analyzed by Leco carbon analyzer, after removal of carbonate minerals, showed values ranging between 0.09 and 2.30 wt%. The major TOC values were found in the deepest intervals of the Tumaco-1-ST-P well (11,610–11,700 ft), which were deposited on calcareous and siliceous siltstones corresponding to the late Oligocene sequence. 47% of the samples analyzed are grouped in the range between 0.5 and 1.0 wt%, which are considered with fair source rock potential. 38% of the samples are classified as O.M. with good quality. Finally, 13% of the total of 250 rock samples analyzed showed TOC values < 0.5%. Rocks organically poor with TOC < 0.5% are considered, in almost all the cases, like rocks with poor generator potential (Bordenave 1993; Peters and Cassa 1994; Hall et al. 2016) therefore, without economic interest. Free hydrocarbons (S1 peak) average value was 0.075 mg HC/g rock (ranging between 0.02 and 0.80 mg HC/g rock). The high heterogeneity of S1 through the stratigraphic column is due to the multiple and successive changes of organic facies in the sedimentary strata. Samples collected at 11,570–11,730 ft in the late Oligocene displayed the highest values of S1 ranging between 0.2 and 0.8 mg HC/g rock, while most of the samples had values < 0.25%, which classifies the generation potential as “poor and/or acceptable” (Peters and Cassa 1994). In practical terms, the peak S1 is less than the removable fraction (EOM) for immature sediments; for mature sediments, peak S1 and the content of EOM fraction are fairly comparable (Peter et al. 2005). S2 values vary between 0.07 and 1 or removal 0.45 mg HC/g rock, with an average of 1.1 ± 1.36 mg HC/g rock. The highest S2 peak values were found in the interval around 11,700 ft in the late Oligocene of the Tumaco Fm. S2 peak at 5570 ft registered a value of 10.45 mg HC/g rock which is inconsistent with the low thermal evolution of the O.M. in the samples, based on the values of TOC, S1 and bitumen extracted (EOM). The value of Tmax is proportional to the thermal maturity of the organic matter in a rock (Tissot and Welte 1984). Tmax values vary between 328 and 445 °C, with an average value of 417.5 °C (SD ± 26.23 °C), indicating rocks relatively immature or at the start of its early maturity. Present-day hydrogen index (HIpd) suggests that a significant number of samples from the Tumaco-1-ST-P well corresponds to type II/III kerogen, characterized by HIpd between 300 and 600 mg HC/g TOC. This kind of kerogen is dominated by liptinitic macerals, despite a minor vitrinite and inertinite input. 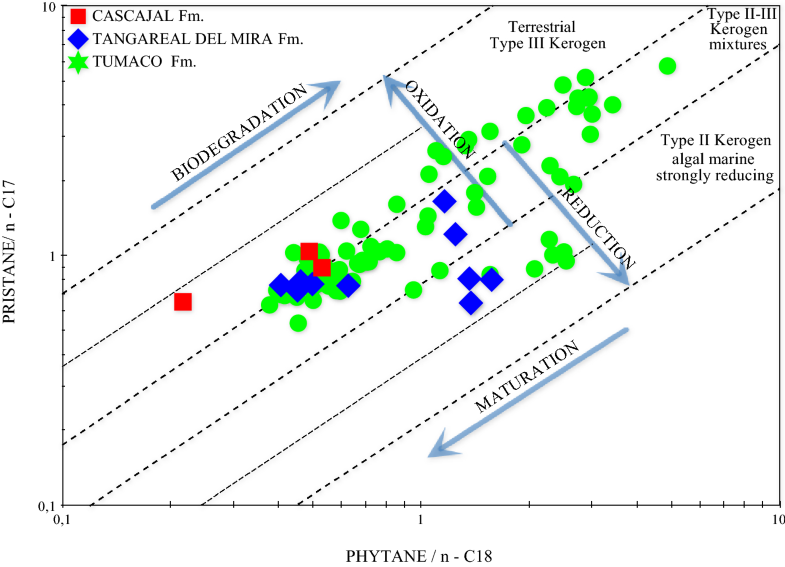 Type II/III kerogen describes mixtures of transitional marine and terrestrial organic matter. Figure 3 displays the hydrogen index (HIpd) versus oxygen index (OIpd) cross-plot to illustrate the quality and level of maturation of the studied samples. Results cover a broad range of maturity between oil-prone type II kerogen with HIpd of 525 mg HC/g TOC and dry gas-prone type IV kerogen with HIpd of 13 mg HC/g TOC values, indicating that the O.M. in study comes from a single and unique kerogen with a significant variation of the organic facies and paleodepositional environments. Figure 4 shows the cross-plot HIpd versus Tmax to correlate kerogen type and thermal maturity in terms of the degree of kerogen conversion, indicating that most of the samples show a Tmax < 430 °C and HIpd < 600 mg HC/g TOC confirming an immature O.M. and type III kerogen. Some specimens, however, show an O.M. with oil generation potential and type II and II/III kerogen. The pseudo van Krevelen diagram between S2 and TOCpd % indicating the type and quality of the kerogen in the rock samples is shown in Fig. 5 (Langford and Blanc-Valleron 1990). Thus, a large number of rocks and cuttings from Tumaco-1-ST-P well confirm a type III and/or IV kerogen (gas prone and dry gas prone, respectively). About 20 samples showed a transitional type II/III kerogen, which would generate oil/gas, and a smaller number of samples presented a type II kerogen (oil prone, usually marine). Thus, Cascajal and Tangareal del Mira formations show the lower quality due to its terrestrial origin and its diagenetic maturity. 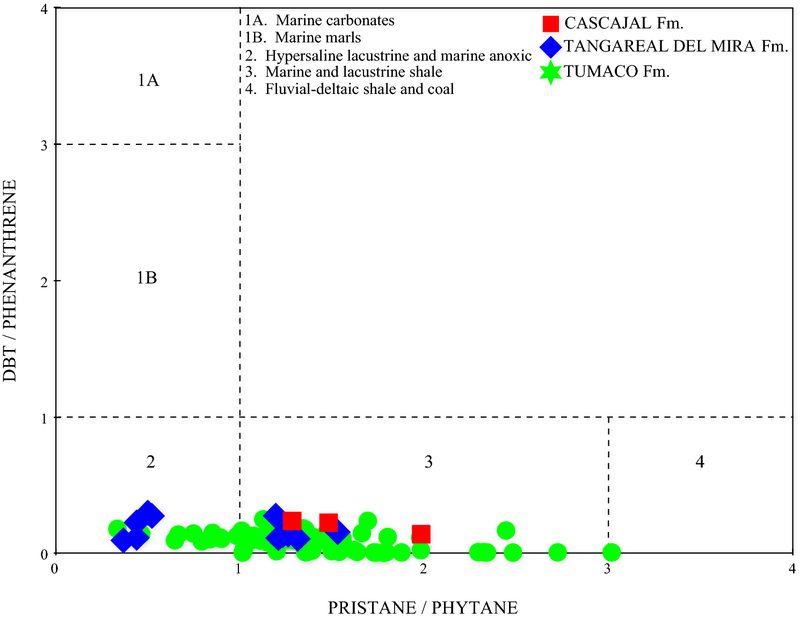 Figure 6 shows the paleoenvironmental evolution based on the lithology and stratigraphic analyses for Tumaco-1-ST-P well (ANH-Antek S.A.S 2013). Since the kerogen type is related to the original type of organic matter and its evolution and preservation over time, which is in turn associated with depositional environment and climate (Hall et al. 2016), the evaluation of depositional environment can be done through the TOC content and RE-pyrolysis data and indexes. Thus, the results discussed in Sect. 4.1 indicate that O.M. was deposited in a fluvio-deltaic and deltaic (upper delta plain/lower delta plain and prodelta) environment on siliciclastic lithofacies with organofacies characterized by input of higher plants, algae, and marine algae on a II/III kerogen type which is consistent with the depositional environment deduced from lithology and stratigraphic analysis. Organic petrography is used almost systematically as a complement of the screening parameters (TOC, RE-Py, Fluorescence, etc.) to evaluate the O.M. type and the characteristics of the depositional environment, such as redox conditions (oxic/anoxic), energy level, microorganisms type, and additional data that allows the quantification of the thermal evolution of the O.M. Mean random Vitrinite reflectance (Rv,r) of the dispersed organic matter was measured on immersed oil and reported in this paper as Ro (Pawlewicz and Finn 2013). Additionally, the Rc was calculated from Tmax (Jarvie et al. 2001). Although this approach works better when Tmax is between 420 and 500 °C, it has been used in this study due to this conversion works marginally well for type III kerogen which includes the most of the analyzed samples. Fifty samples were selected through the stratigraphic column for Ro analysis in order to better understand its thermal maturity and hydrocarbons potential. The average Ro value was 0.4046 ± 0.065% indicating an immature O.M. The variation of Ro with depth and the petrographic analysis indicates that almost all samples in the Tumaco-1-ST-P well are in the immature state where samples from Cascajal and Tangareal del Mira Fms show the lowest maturity, while the highest maturities were found in the Tumaco Fm. suggesting a consistent light increment of maturity with depth. 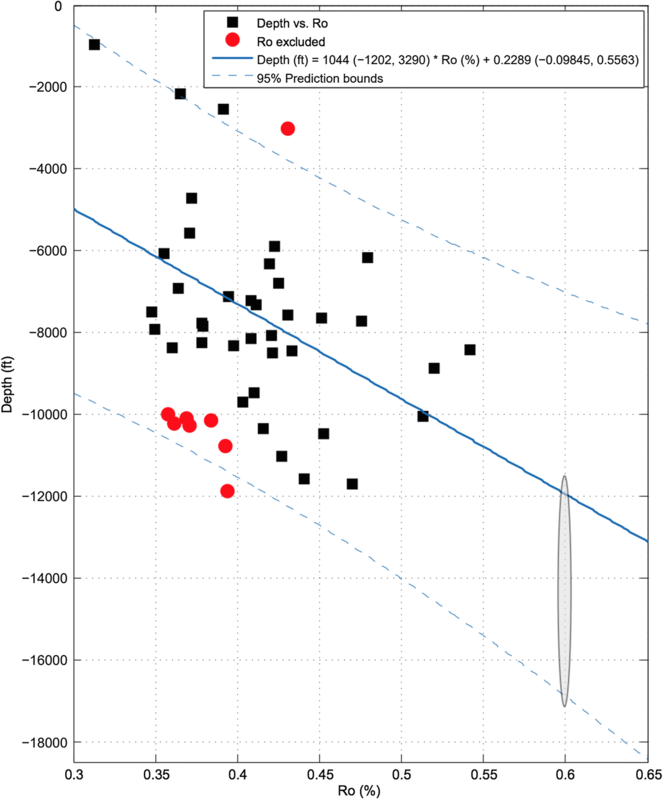 This linear regression with confidence bounds of 95%, suggests a depth range up to approximately 17,000 feet (see ellipse) where it is expecting that the potential source rock will enter into the generation window for Tumaco Basin, Colombia. To estimate the extension of the petroleum-generation process and the total generative capacity in an already mature source rock, information on the TOC and HI of organic matter prior to the onset of hydrocarbon generation is required (Jarvie 2012, Hall et al. 2016). Although TOCpd and HIpd classified the organic matter deposited in Tumaco 1-ST-P as immature for what one could assume that HIpd should be equal HIo (Jarvie 2012), we have used KinEx source rock modeling software (www.zetaware.com) to calculate the original TOC and HI based on present-day analyses (Table 1). The minimum differences in the original and present-day TOC and HI confirm that the O.M. in Tumaco-1-ST-P is very immature and that the data could be used to calibrate the maturity in the basin (Jarvie 2012). On average, the HIo (117.57 mg HC/g TOC) differs from HIpd (109.85 mg HC/g TOC) and is about 7.72 mg HC/g TOC confirming an immature stage of the O.M. in the sample rocks. Figure 9 presents an idealized geochemical logging based on screening values (TOC and RE-Py) and the experimental vitrinite reflectance (Ro) associated with lithofacies, stratigraphic units and the age for Tumaco-1-ST-P well applying the molecular stratigraphy concepts, which allows observing the changes of organic facies that occur laterally or vertically into the column (Demaison in Peters 1986; Espitalié et al. 1987; Burwood et al. 1990; Peter et al. 2005). Tmax and Ro increase consistently with increasing depth and maturity; HIpd shows a few variation with depth in Tumaco Fm, except in the deepest interval where it is consistent with TOCpd contents, indicating a few kerogen conversion to petroleum or gas (low transformation ratios values). Table 1 also displays organic geochemical characteristics based on EOM %, SARA, and GC/FID analysis of the bitumen extracted. The EOM is very low, ranging between 0.0018 and 0.75%, being the deepest units of the Tumaco-1-ST-P well (11,650 ft) which contains the largest concentrations. Thus, the EOM values characterize the Cascajal and Tangareal del Mira formations as poor, while Tumaco Fm varies between fair and good quality (Bacon et al. 2000). The quantity and composition of the bitumen extracted depend on the original organic matter, organic facies, depositional environment, thermal maturity, and the extension of the expulsion and could also reflect contamination by drilling mud/fluids or migration of hydrocarbons. These last two events are discarded in Tumaco-1-ST-P well due to the low amount of O.M. extracted. SARA fractionation shows the highest values for the resin fractions (NSO compounds), in most of the organic extracts, varying between 17.47 and 62.33%. Asphaltene fractions vary between 4.65 and 59.02%, and the aromatic fractions range between 0.1 and 21.28%. Finally, the fraction of saturated hydrocarbons varies between 4.99 and 43.81%. Tissot and Welte (1984) proposed a ternary diagram to identify the organic matter type based on the SARA fractionation. Thus, Tumaco-1-ST-P well samples classify as naphthenic bitumen due to its high resin and asphaltene concentrations. The SARA analysis shows a relatively low dispersion on its fraction, indicating that this bitumen has the same source and origin. The saturate/aromatic ratios are in all samples very high, except in the sample T2928 (0.29%). Thus, the SAT/ARO ratio indicates a very low content of aromatic hydrocarbons in the entire column and limits the use of the aromatic fraction as maturity indicator as it will be discussed later in Sect. 4.4.2.1. Gas chromatographic profiles of selected crude oils are shown in Fig. 10. The geochemical ratios based on n-alkanes distribution are displayed in Table 2. In general, the n-alkanes are the most abundant components in the saturate fraction for all samples (range 4.39–43.81%) although as stated above saturated hydrocarbons are the major fraction of the bitumen extract. Bitumen extracts have a n-alkanes distribution between n-C10 and n-C33, with bimodal distribution and maximum between n-C15 and n-C17, indicating an algal/microbial input and n-C25 to n-C27, showing a significant input of terrigenous organic matter, suggesting that this O.M. was originated from a type II/III or III kerogen. A dominance of n-alkanes around of n-C17 is thus interpreted as an indication of a marine source (Jones 1986). The GC profiles for samples T5509 and T-8243 show a special characteristic associated with the presence of high concentration of unknown organic compounds around n-C29 to n-C31 and related to recent O.M. (immature) in a process of decomposition and consistent with the concept that many of these samples are in an early diagenetic stage. A marine-deltaic transitional environment has been strongly supported by the geological model proposed in the original ANH-Antek technical report (ANH-Antek S.A. 2013). The terrestrial origin of a large part of the organic extracts studied comes from the epicuticular wax high plants, which presents a wide distribution of n-alkanes with a marked predominance of hydrocarbons with odd number of carbon atoms (n-C25, n-C27, n-C29, n-C31); while samples of marine origin located more toward the bottom and in the deepest part of the column have a significant bacterial, algal, and phytoplanktonic contribution, characterized by a predominance of heptadecane (n-C17). Some of the chromatographic profiles allow observing a hump or the so-called unresolved complex mixture (UCM), which confirms that different levels of diagenetic biodegradation are in progress in the basin. The Pr/Ph ratio in Tumaco-1-ST-P displays values below 3.0, although most of the samples fall between 1.0 and 1.5, which indicates that these samples were deposited in a suboxic to oxic environment and were derived from marine shales. There are some samples with values of Pr/Ph ratio < 1.0, suggesting a more carbonatic bitumen. Bitumen and crude oils derived from marine shale have a CPI values ranging from low to moderate (1.0–3.0), while those derived from source rocks containing mainly terrestrial O.M. present Pr/Ph ratios between 3.0 and 10. Carbonate rocks show Pr/Ph < 1.0 (Didyk et al. 1978). When the Pr/Ph is used as an indicator of redox conditions, a value < 3.0 for the organic extracts of the Tumaco-1-ST-P well, indicates that this O.M. was generated under suboxic–oxic conditions. According to Didyk et al. 1978, Pr/Ph < 1 in bitumen and crude indicates an environment at anoxic depositional environment, while Pr/Ph > 1 indicates an oxic deposition. In Tumaco-1-ST-P rocks, the Pr/Ph ratios display values below 3.0, with a high population of data ranging between 1.0 and 1.5, suggesting that these samples were deposited in a suboxic to an oxic environment. The n-alkanes/isoprenoids ratios (Pr/n-C17 and Ph/n-C18) decrease with the maturity since more n-alkanes are released from kerogen by cracking (Tissot et al. 1971) and are more thermally stable than isoprenoids. 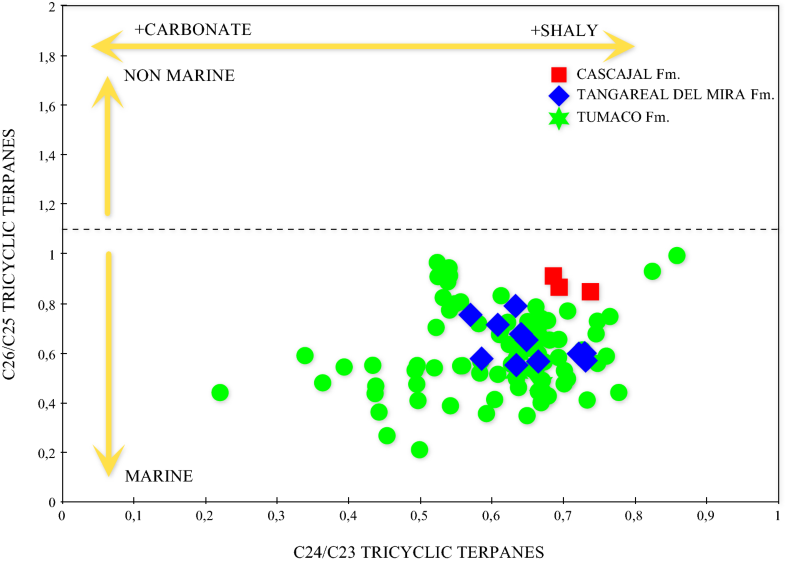 Figure 11 shows that most of the samples in Tumaco-1-ST-P well have been originated from type II-III kerogen (transitional marine-terrestrial) and type III kerogen (terrestrial), although a few samples from Tangareal del Mira and Tumaco formations seem to have been originated from a type II kerogen (marine). Thus, Pr/n-C17 varies between 0.53 and 5.74 and Ph/n-C18 ranging between 0.22 and 4.88, suggesting a broad range of maturities and biodegradation processes and a depositional environment from suboxic to oxic characteristics. The carbon preference index (CPI) relates the odd/even hydrocarbon predominance (Bray and Evans 1961). Immature rocks with a significant contribution of superior plants are dominated by odd n-alkanes, especially n-C27, n-C29 and n-C31. These n-alkanes are originated from the epicuticular waxy (plant leaves) and are synthesized directly by plants or by defunctionalization from alcohols, acids or esters, in whose case, the CPI values will be > 1.0. n-alkanes derived from marine O.M. tend to have a small or not marked CPI. Regarding to hypersaline carbonates or evaporitic rocks, CPI presents a slight pair preference of numbers of carbon. In all cases, the CPI decreases with the maturity of the O.M. This is due to a geochemical process that combines the n-alkanes generation from the kerogen and derived from different biological precursors and thermal cracking of hydrocarbons in the early diagenesis. The CPI values found in Tumaco-1-ST-P well present a wide dispersion ranging between 0.47 and 6.73, with a high amount of CPI values ranging between 1 and 3 and a few number of samples (< 6%) with CPI < 1.0. High values of CPI indicate low maturity and terrestrial origin, bitumen with CPI around 1 originating from marine contributions. Samples from Cascajal Fm present CPI values ranging between 1.20 and 1.71 indicating a marine-deltaic transitional O.M. source located in a paleoenvironment of deltaic plain highly immature. The Tangareal del Mira bitumen presents CPI in the range between 1.23 and 3.41 confirming a transitional marine-deltaic depositional environment, while the Tumaco Fm maintains the same marine-deltaic influence of the previous formation up to a depth of approximately 8000 ft, from which up to 12,000 ft, becomes a paleoenvironment with a tendency to the marine platform (shelf marine). The vertical distribution of terrestrial/aquatic O.M. ratio (TAR) values is relevant to determine the relative changes in the contribution of the terrestrial versus aquatic O.M. over the time, particularly considering recent sediments (Meyers 1997). TAR displays values varying between 0.05 and 16.17 (average 2.18), which confirms the constant variations of organic facies from algal/bacterial and/or land origin through the stratigraphic column. High TAR values in recent sediment extracts, as in the case of Tumaco-1-ST-P, indicate a great contribution by land plants that aquatic to the depositary environment (Bourbonniere and Meyers 1996, cited by Peter et al. 2005). This ratio should be used with care since it is susceptible to drastic changes by effects of maturation and biodegradation. The biological markers were identified based on full-scan GC/MS analysis, comparing the mass fragmentograms of the specific biomarkers with data previously reported (Philp 1985; Wang 1993; Peter et al. 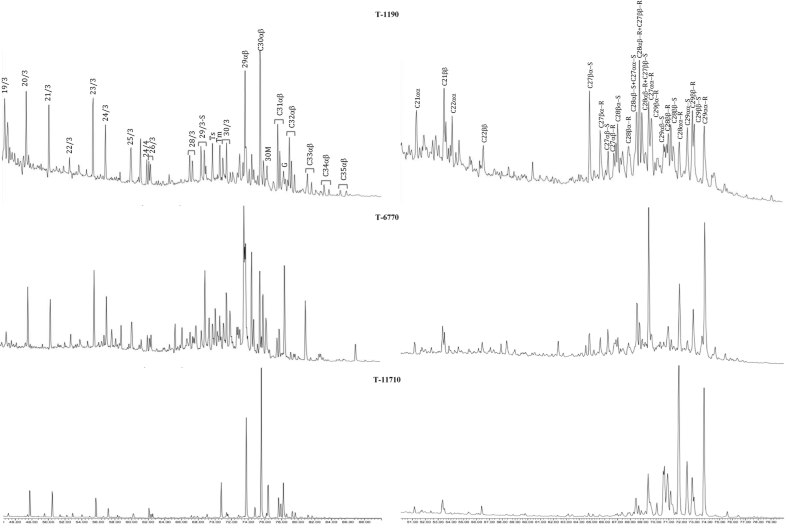 2005) and with bitumen and crude oils of known composition (e.g., NGS NSO-1 oil sample, NPD-Nigoga; Boscan crude oil, Venezuela; Cauca/Patia and Buenaventura rock extracts, Colombia) (NPD-Nigoga 2000; Antek S.A. 2011). 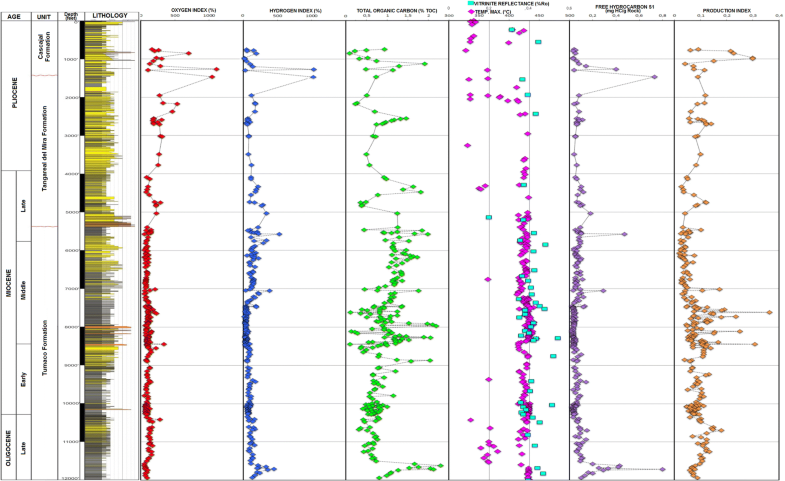 Figure 12 (on the left) shows the tri-, tetra-, and pentacyclic terpane mass fragmentograms (m/z 191) and steranes (m/z 217) (on the right) for Tumaco-1-ST-P selected samples, while Table 3 displays the main geochemical correlation from terpane and sterane results. 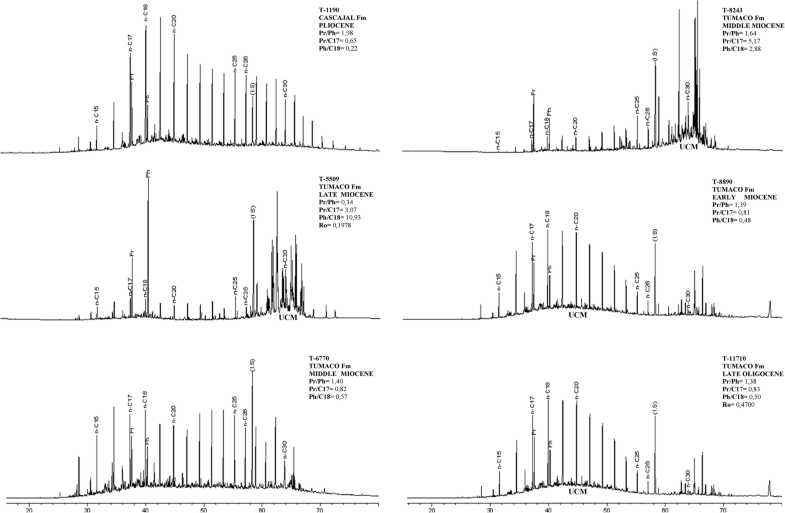 The terpane chromatographic profiles exhibit a particular features such as that the C30αβ(H)-hopane is the biggest terpane; the tricyclic terpane fraction extends from C19/3 until C30/3-R/S, Ts < Tm; the oleanane and gammacerane are present in medium to high concentrations; homohopanes are present in relatively low concentration and in some samples do not exist. When they are present, are distributed between C31 and C35, decreasing in the order C31 > C32 > C33 > C34 > C35-R/S. Geochemical correlations based on the tricyclic terpanes such as TT19/TT23, TT23/TT30, TT24/TT30 and TT25/TT26 are excellent indicators of source and depositional environment. Thus, Table 3 shows that TT19/TT23 ratios vary between 0.06 and 0.58, except for the sample T-1190 that presents a value of 1.10. These low ratios suggest an important bacterial/algal over terrestrial origin. TT21/TT23 ratios present values > 1.0 for most of the samples corroborating a marine origin associated with prokaryotic organisms (algal/bacterial). However, in the shallower intervals of the Cascajal and Tangareal del Mira Fm, the TT21/TT23 ratios display values slightly higher than 1, indicating a combined contribution of bacterial/algal O.M. with a significant terrestrial input. TT23/30H ratios and Σtricyclic terpanes/Σhopanes do not show a trend that clearly shows the origin of the O.M. along the stratigraphic column. Values vary alternately around 1.0, indicating a significant higher plant (continental) contribution to the O.M. toward the shallower formation of Cascajal and Tangareal del Mira, while in the deepest part of the well, the Tumaco Fm, the O.M. is mainly marine contributions from bacterial/algal inputs. C24TeT/C30-hopane ratios are quite used in the characterization of the paleodepositional environment (Peter et al. 2005). The highest abundances of tetracyclic terpane C24TeT have been found in marine-deltaic and lacustrine saline environments (Rocha-Mello et al. 1988). In Tumaco-1-ST-P, C24Te/H30 ratios present values < 0.44, which dismisses a carbonate or evaporitic environment but it supports a marine shale or marine-deltaic depositional environment. Burwood et al. (1990) found that marine bitumen and crude oils from West Africa showed TT25/TT26 ratios > 1.0, while terrestrial bitumen showed TT25/TT26 values < 1.0. 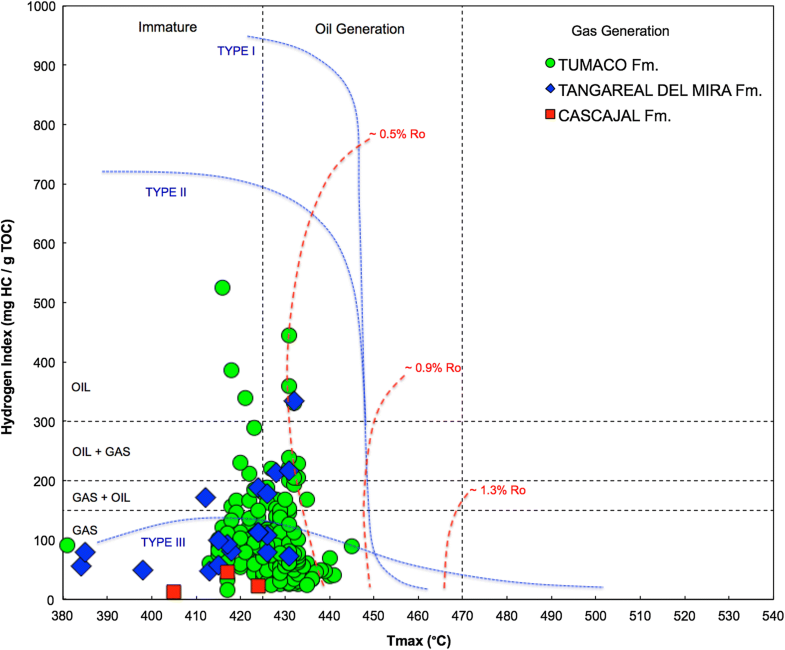 Thus, in the Tumaco-1-ST-P well, this ratio confirms the marine origin of the studied samples as is shown in Fig. 13. Since TT24/TT23 is greater than 0.5 for most of the samples in Tumaco-1-ST-P suggest organic facies associated with marine shales. Steranes in selected samples from Tumaco-1-ST-P (Fig. 12) allow observing that pregnanes, excellent indicators of salinity, are present in medium concentration, although in some samples these are biodegraded or have not been formed. The C27 diasteranes (rearranged steranes) are present in significant concentrations, which suggest a silisiclastic environment (27D/29ααR > 1.0). C27-, C28-, and C29-steranes are present in varying concentrations and without any predominance between them, which suggest alternating contributions of algal/microbial and land plants (transitional environment) origin. The configuration of ααR-sterane in most of the samples is greater than ββ-R-S or ββ-S, which indicates an immature O.M. The diasteranes/steranes ratio is routinely used in geochemical studies to distinguish between carbonate and siliciclastic source rocks. Low values of this ratio in bituminous extracts indicate anoxic carbonate source rocks poor in clays. On the contrary, high diasteranes/esteranes ratios are typical of bitumen derived from source rocks containing abundant clays (Cortes et al. 2018). The diasterane/sterane (27-dia/29ααR) ratios for Tumaco-1-ST-P well show values > 2.0, which clearly indicates a higher diasteranes content over the regular steranes, suggesting that this organic matter was deposited on siliciclastic rocks in a transitional marine-continental environment. The 20S/(20S + 20R) ratio is one of the maturity parameters more frequently used in petroleum geochemistry. The isomerization of carbon C20 on the C29-5α(H),14α(H),17α(H)-sterane causes an increase in the 20S/(20S 20R) ratio between 0.0 to ≈ 0.5 with an increment of the maturity (equilibrium between 0.52 and 0.55, Seifert and Moldowan 1986) (Cortes et al. 2018). Bitumen in Tumaco-1-ST-P well has values in the range between 0.0 and 0.4 (average 0.13), which indicates a very low maturity. The C29 ββ/(ββ + αα) ratio typically presents its thermal equilibrium between 0.68 and 0.72. Bitumen extracts from Tumaco-1-ST-P rocks show a value around 0.1, confirming that these samples are immature or in the diagenetic stage. Thermal maturity is the most important process in evaluation of oil and gas potential. Geochemical correlations based on aromatic hydrocarbons can be potentially better than those obtained in the saturated biomarkers fraction due to they are sensitive to differences in thermal maturity from the middle stage to the final part of the window of hydrocarbons generation (Radke 1988). A great variety of geochemical ratios based on the composition of the aromatic fraction has been proposed associated with the relationship between the concentration of the more thermally stable isomers and their counterparts less stable (Radke and Welte 1983; van Aarssen and de Leeuw 1999). Maturity parameters derived from methylnaphthalenes (MN) are based on the idea that naphthalenes with compound methyl β-substituted are more stable than those with methyl α-substituted. The maturity parameters based on the phenanthrene (P) and methylphenanthrenes (MP) are based on the high stability of the 3-MP and 2-MP compared with 9-MP and 1-MP (Radke and Welte 1983). The isomers of the alkyldibenzothiophenes (MDBT) with a methyl substituent in position 4 are more thermodynamically stable, whereas isomers with a methyl substituent in position 1, have low stability (Chakhmakhchev et al. 1997). In Tumaco-1-ST-P bitumen extracts, the aromatic hydrocarbons were identified based on full-scan GC/MS analysis and quantified by GC/MS-SIM mode using the selected ions for alkylnaphthalenes, alkylphenanthrenes, alkyldibenzothiophenes, mono- and triaromatic steroids (Sect. 3.6) comparing the mass fragmentograms with data previously reported (Hughes 1984; Budzinski et al. 1995; van Aarssen and de Leeuw 1999) and with bitumen and crude oils of known composition (e.g., NGS NSO-1 oil sample, NPD-Nigoga) (NPD-Nigoga 2000). Figure 14 shows the alkylnaphthalenes, alkylphenanthrenes, and alkyldibenzothiophenes fragmentograms for sample T-11610 of Tumaco-1-ST-P well, while Table 4 displays the main geochemical correlation with aromatic results. There is evidence that in the hydrocarbon generation window, the aromatic hydrocarbons show systematic changes with an increment in the thermal maturity (Hughes 1984; Radke and Welte 1983; Alexander et al. 1985). However, in an early stage (diagenesis), the geochemical parameters based on the alkylaromatics, as in Tumaco-1-ST-P, show an irregular behavior due to quick variations in the organic facies, control from source effects, thermal stress, and biodegradation of the O.M. Methylnaphthalenes are found and widely distributed in the sedimentary organic matter (Tissot and Welte 1984). Their distribution is highly variable among samples (even in the same producer field or in a stratigraphic column) (van Aarssen and de Leeuw 1999). The sesquiterpanes and triterpenoids derived from microorganisms and superior plants appear to be the origin of the MN (Püttman and Villar 1987), where they are produced through isomerization and transmethylation reaction in an environmental rich in acid clays. In Tumaco-1-ST-P, MN ratios vary between 0.25 and 5.19 (mean 1.68±0.73) indicating a high variability in the maturity and suggesting a common origin but different states of thermal maturity consistent with an intense diagenetic biodegradation process. As the thermal maturity increases, the predominance of 2-MN over 1-MN increases. This increment toward the depth must be interpreted as an increase in the maturity toward deeper intervals (Tumaco Fm, late Oligocene). The dimethylnaphthalenes ratios (DNR) vary between 0.03 and 21.5 indicating a wide maturity distribution. Among TMNs, the most abundant isomer for a mixture in equilibrium (highly mature) is the 2,3,6-TMN, and one of the less abundant is the 1,2,5-TMN, which is often the most abundant in immature samples (Budzinski et al. 1995). van Aarssen and de Leeuw (1999) found that the presence of 2,3,6-TMN is very low in the diagenetic stage and increases dramatically in samples highly mature in which this isomer is dominant over the 1,3,7-TMN and 1,3,6-TMN. The distribution of alkylphenanthrenes can be used as an indicator of source, in addition to its well known use as a parameter of maturity (Armstroff et al. 2006). Differences due to variations in the thermal maturity are in many cases gradual, while changes in the source of the O.M. are characterized by drastic differences. The alkylphenanthrenes distribution is dominated by 2-MP and 9-MP isomers at any stage of maturity. In Tumaco-1-ST-P well, 2-MP and 9-MP are predominant over 1-MP and 3-MP indicating a marine origin (Budzinski et al. 1995). Methylphenanthrene-1 and -2 indices (MP-1 and MP-2) proposed by Radke and Welte (1983) are perhaps the most widely used indices to determine the maturity based on aromatic hydrocarbons. The utility of this geochemical parameter rests on the relative stability of the various methylphenanthrene isomers. Due to its linear relationship with the vitrinitic reflectance within the generation window, MPI-1 is often used to infer the value of the equivalent vitrinitic reflectance (Rc, %) in crude oils (Radke 1988) and could be used in source rocks and bituminous extracts of outcrops where the vitrinitic reflectance cannot be measured. The MPI-1 values in Tumaco-1-ST-P show an average value of 0.60 and a mean value of Rc of 0.76%. Since 4-methyldibenzothiophene isomer is more stable than 1-methyldibenzothiophene, the 4-/1-methyldibenzothiophene (MDBTR) was proposed as an indicator of maturity (Radke et al. 1986). This ratio is quite sensitive to the maturity, correlating well with the vitrinitic reflectance and with Tmax parameter from pyrolysis Rock–Eval in rock samples (Radke 1988). Dzou and Hughes (1993) noted that MDBTR is particularly robust to assess maturity in samples with high thermal maturity (condensates, lighter crudes). The organic extracts of the Tumaco-1-ST-P well presented an average value of 5.40, indicating that the 4-methyldibenzothiophene is in the highest concentration that 1-methyldibenzothiophene. The maturity based on MDBT ratios increases from surface to bottom in the column reaching the highest values in the Tumaco Fm between the early and middle Miocene. The dibenzothiophene/phenanthrene ratio (DBT/P) is thought to be an indicator of source rock lithology (Radke et al. 1986, Hughes et al. 1995) with carbonates having ratios > 1 and shales < 1. When this ratio is plotted against Pr/Ph, the depositional paleoenvironment may be inferred regarding microbiological and chemical processes (Hughes et al. 1995). Figure 15 shows a plot of DBT/P versus Pr/Ph associated with rock lithology for a bituminous extract of Tumaco-1-ST-P, indicating that samples fall in the area of a lacustrine and marine shale environment (zones 2 and 3, respectively). The zone 2 suggests a variable lithology of the rock with values of DBT/P < 1 and values of Pr/Ph < 1 and characterizing an lacustrine environment, while the zone 3 presents a lithology of shale, in an marine environment and DBT/P < 1 and Pr/Ph in the range between 1 and 3. The molecular stratigraphic interpretation allows to conclude that organic facies and lithology in Tumaco-1-ST-P are characterized in Cascajal and Tangareal del Mira Fms. (1000–5000 ft) by a marine-deltaic paleoenvironment with an important terrestrial contribution and varying between deltaic plain and prodelta during the late Miocene as is supported by C15+ n-alkanes profiles, CPI, Pr/Ph, TAR, oleanane index, and tricyclic/pentacyclic terpanes (Internal communication stratigraphy Antek S.A.-Paleoxplorer in ANH-Antek S.A. 2013). At the top of Tumaco Fm (5000–9000 ft) in the late to medium Miocene, the depositional environment was like to the marine delta of the Tangareal del Mira Fm, changing to a marine platform environment at 8000 to 10,000 ft depth in the middle to early Miocene, which is confirmed by high ∑tricyclic terpanes/∑pentacyclic terpanes, low oleanane index, high C35/C34 homohopanes ratios. Toward the bottom of the column (10,000–12,000 ft), Tumaco Fm was deposited in the late Oligocene under a marine shelf environment, which is supported by Pr/Ph < 1.0, DBT/P < 1.0, low C26/C25 tricyclic terpanes ratios, high C24/C23 tricyclic terpanes ratios. 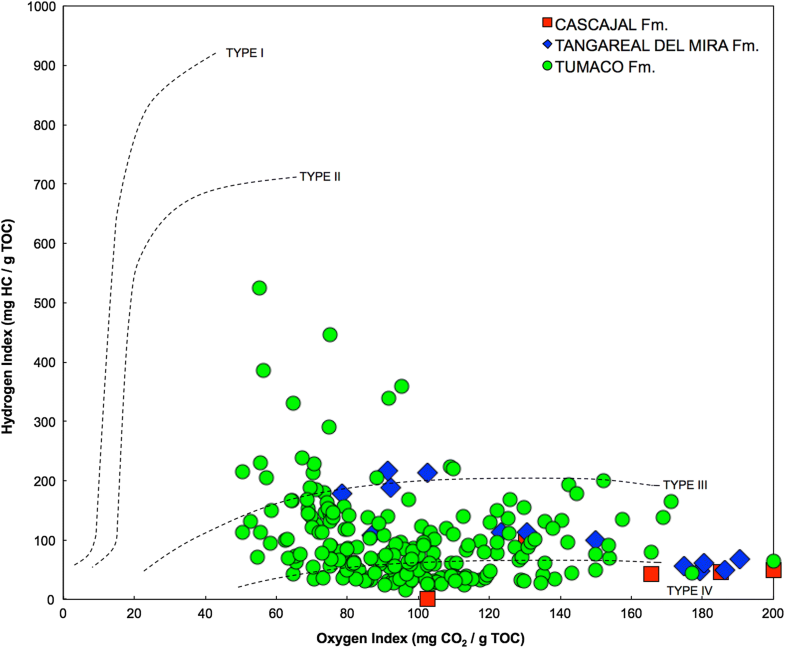 Total organic carbon in samples from Tumaco-1-ST-P presented an average value of 0.95% on a population of 250 samples analyzed, with a variation between 0.09 and 2.30%. This variability suggests a temporal and spatial variations of organofacies in the sedimentary record. Results of Rock–Eval pyrolysis showed that S1 peak varies between 0.02 and 0.80 mg HC/g rock, which classifies the O.M. with a “poor to acceptable” generation potential. S2 peak varied between 0.07 and 10.45 mg HC/g rock (average 1098±1.36 mg HC/g rock). Peak S3 showed values between 0.20 and 7.60 mg CO2/g rock, while Tmax values varied in the range between 328 and 445 °C, which indicates a relative immaturity of the O.M. (diagenetic maturity). Geochemical correlations based on screening data allowed to conclude that S2/S3 varied in the range between 0 and 10, whereas HIpd presented three major peaks that classified the O.M. quality with a type III and/or type II/III kerogen. This classification would expect that the main product generated will be crude oil and/or crude oil/gas, special in the deepest intervals of the well. Production index varied between 0.02 and 0.36 classifying these rocks in a immature generation stage. However, the combination of the I.P with other maturity parameters allowing to look, in a more discreet way, that the column covers a wide range of maturity from a kerogen oil–gas-prone type II/III to a kerogen non-generator type IV, indicating that the O.M. in the study does not come from a single and unique kerogen due to the large variation in paleodeposicional environments. On the basis of the modified van Krevelen diagram, the type III kerogen, which is responsible for the majority of immature samples from Tumaco-1-ST-P well was characterized to have low H.I (50–200 mg HC/g TOC), low H/C atomic ratios (0.7–1.0), and high O/C values (> 0.3). Vitrinite reflectance (Ro) varied between 0.1978 and 0.5418% (mean 0.4046±0.056%), suggesting an immature O.M. The maceral groups found were vitrinite, liptinite, and inertinite, which allowed us to identify the following types of macerals: esporinite, cutinite, resinite, alginite, colotelinite, colodetrinite, funginite, exsudinite, exsudatinite, inertodetrinite, among others. The EOM, % oscillation between 0.0018% and 0.75%, being the highest contents toward the late Oligocene in the Tumaco Fm. SARA fractionation presented high values for the resin fraction in most of the organic extracts, varying between 17.47 and 62.33%. The asphaltenes varied in a range between 4.65 and 59.02%, the aromatic fraction ranging between 0 and 21.28% is the fraction of which were obtained lower recoveries. Finally, saturated fraction ranged between 4.99 and 43.81%. The Tissot and Welte’s ternary diagram indicates that the organic matter extracted was of naphthenic characteristics. C15+ GC/FID analysis of the saturated fraction showed a bimodal distribution in hydrocarbons resolved between n-C15 and n-C32, although some chromatograms extend their distribution to n-C36, with a maximum around n-C19 to n-C20 suggesting an algal/bacterial input, while the second peak occurs around n-C29 to n-C31, indicating a continental contribution (terrestrial), allowing to conclude that this is a mixed O.M. originated from type II/III kerogen. The geochemical correlations based on C15+ saturated fraction show a CPI characteristic of a low maturity and marine/continental origin. Pr/Ph ratio suggests a bitumen derived from marine shale, additionally Pr/Ph < 3.0, indicating that O.M. was deposited in suboxic to oxic conditions. Pr/n-C17 varied between 0.53 and 5.74, while Ph/n-C18 ranges between 0.22 and 4.88, indicating low maturity. TAR values suggested that O.M. has an important aquatic algal/bacterial input over terrestrial contributions. Geochemical correlations based on saturated fraction biomarkers analyzed by GCMS showed that TT21/TT23 present values > 1.0 for most of the samples corroborating the marine origin associated with prokaryotic organisms (algal/bacterial). However, in the deepest intervals (late Oligocene of Tumaco Fm), TT21/TT23 present values slightly higher than 1.0, indicating a combined and alternated contribution of bacterial/algal with less terrestrial contribution. C24Te/H30 ratios showed values < 0.44, which dismisses a carbonate or evaporitic environment but supports a marine shale or marine-deltaic depositional environment. TT25/TT26 ratios in all samples, without exceptions, showed values > 1, which confirms a marine origin. Tm ≤ Ts suggests a diagenetic maturity. Ts/(Ts + Tm) ratios presented values < 0.7, with a high amount of results ranging between 0.02 and 0.5 suggesting a low maturity. When this parameter is used as an depositional environment indicator, the average value of 0.40 found in the Tumaco-1-ST-P well indicates a marine-deltaic environment. The oleanane index > 20% corroborates a terrestrial O.M. input with marine contribution and the Miocene–Pliocene as the age of this organic matter. Many samples in the Tumaco-1-ST-P well showed a high concentration of gammacerane and low Pr/Ph ratios indicating a high salinity and saline stratification of the water column during deposition. The ββ-steranes values decreased as %C27αββ > %C28αββ > %C29αββ, corroborating a marine environment with minor terrestrial contributions. C27 αα-R, C28 αα-R and C29 αα-R (biosteranes) are present in high concentrations confirming a thermal immaturity of these samples. C29 ααα-(S/R) ratios present values < 1.0, which indicates that the αα-R-sterane configurations are in higher concentrations over the αα-S configuration (geosteranes, more stable thermodynamically) and consequently highly immature. Diasteranes/steranes (27-DIA/29 αα-R) ratios in Tumaco-1-ST-P well presented values > 2.0, indicating that this organic matter was deposited on silisiclastic rocks in a transitional marine-terrestrial environment. 20S/(20S + 20R) ratios are in the range between 0.0 and 0.4 (average 0.13), which indicates a very low maturity, while the C29ββ/(ββ + αα) ratios with a value around 0.1 indicate that the O.M. studied is below the equilibrium range (below hydrocarbons generation window). The geochemical correlations based on aromatic hydrocarbons showed that methylnaphthalene ratios (MNR) and trimethylnaphthalene ratios (TMNR) presented a high variability in the samples maturity suggesting a common origin but different stages of thermal maturity consistent with an intense diagenetic biodegradation in progress. The monoaromatic steroids (MAS) decreased in concentration with depth (Pliocene to Oligocene) suggesting a light increment in the thermal maturity. On the other hand, the concentration of triaromatic steroids (TAS) increased proportionally with depth as a result of the MAS transformation into its respective TAS counterpart. 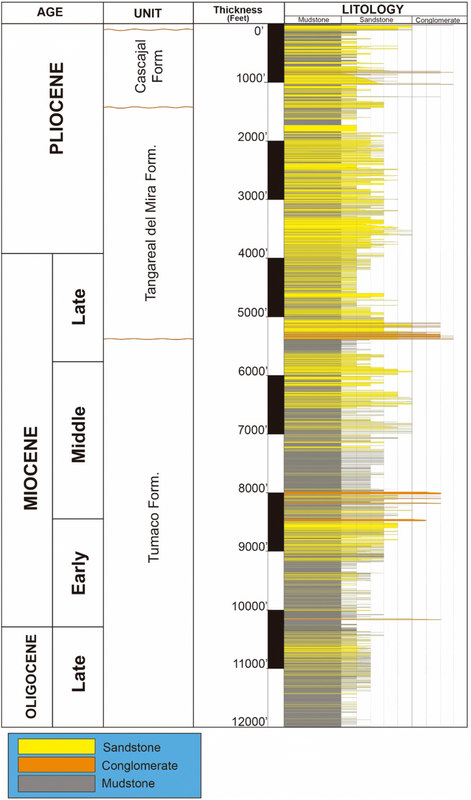 This maturity model, although in the diagenetic stage, is consistent with a maturation process in progress in the Tumaco basin, where the Oligocene (Tumaco Fm) showed the greater maturity. The present discussion about geological setting and regional high-resolution molecular stratigraphy was taken from the technical report presented by Antek S.A. to the ANH-Colombia under contract no. 153-2012. The authors wish to acknowledge National Hydrocarbons Agency, NHA-Colombia for permitting to use the data for the present publication. Paleoexplorer S.A.S. is gratefully acknowledged for the stratigraphy work under sub-contract with Antek S.A.S. RA Geologia is gratefully acknowledged for discussions of the petroleum geology of the study area. JEC and CAV thank to Department of Geosciences, Universidad Nacional de Colombia for supporting this research. The original paper has been beneficiated greatly from the advice and review of an anonymous reviewer.